Sydney radio talk show host Alan Jones on Tuesday apologised for comments he made to the head of the Sydney Opera House, after calling for her to be sacked for refusing to display an advertisement for a coming horse race on the sales of the iconic building. However the row continues over the New South Wales government’s decision, in response to hectoring by Jones, to overrule the decision by Opera House chief Louise Herron, so Australia’s most famous landmark will tonight beam a promotion for the race, promoted as “the richest turf race in the world”. 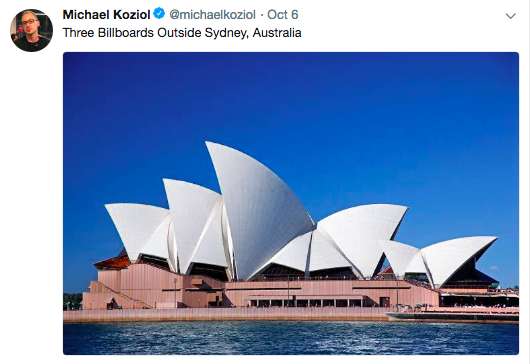 With Prime Minister Scott Morrison weighing in by calling the Opera House the “biggest billboard in the city”, it’s a critical argument about corporate advertising and public space, which also raises many other questions, as Tim Costello, director of the Alliance for Gambling Reform, writes in the article below. These include big questions about the role and power of the broader gambling industry, particularly in New South Wales, transparency and vested interests in the media, and when Australia might take a public health approach to gambling addiction as it has on tobacco control. This article was originally published at Guardian Australia. We thank the Alliance for permission to republish it here at Croakey. Is this the tipping point? Will we one day look back and thank Alan Jones for drawing attention to the disgrace that is Sydney’s capture by the gambling industry with his nasty hectoring of Opera House CEO Louise Herron? I’ve spent 25 years trying to wind back Australia’s world record levels of gambling harm and didn’t generally take issue with the racing industry until the foreign bookmakers such as Sportsbet, Ladbrokes and now Beteasy invaded Australia and turned us into the world’s second biggest regulated sports betting market with an endless deluge of advertising. The 2016-17 national gambling statistics were belatedly released last week and show losses from gambling on racing jumped 6.9% to a record $3.31bn while sports gambling losses jumped 15% to a record $1.06bn. Do they really need an Opera House gimmick with that sort of growth? But this is nothing compared with the $14bn Australians lose on the pokies (including casinos). Almost half this figure comes in NSW. And Alan Jones is not just a spruiker for the racing industry. He will be one of the headline speakers at the Clubs NSW annual conference in Sydney, delivering a 75-minute speech next Sunday morning. He also recently appeared in a Clubs NSW magazine bagging local councils for daring to advocate for policies which might reduce the enormous harm caused by gambling in NSW. Clubs NSW is a ruthless lobbying machine dedicated to protecting its $4bn a year in pokies revenue. Indeed, Clubs NSW is hoping to announce a new four-year agreement with the NSW Coalition government during its conference. This will be an interesting test for the premier. If you thought Gladys Berejiklian’s capitulation over the Opera House was bad, read the two previous memorandums of understanding with Clubs NSW signed by her predecessors Barry O’Farrell in 2010 and Mike Baird in 2014. All I can say is don’t sign it, Gladys. No other industry gets such a sweetheart deal with a four-year commitment to do nothing to tackle gambling harm. These deals have led to NSW clubs having the lowest pokies taxes of any Australian state, and permission to use lethally addictive machines with $10 maximum bets, exemption to smoking bans, no limits to ATMs and the ability to load up to $7,000 in cash into a machine at one time. Thanks to this uniquely permissive regulatory regime, NSW residents are now losing an average of $1,020 a year on the pokies, well clear of Queensland which is the next worst at $610 followed by Victorians at $534. Don’t expect to hear Jones talk about that. You’ve got to ask, where are the basic editorial standards at 2GB? Maybe this is one for shareholders to raise at the upcoming Macquarie Media AGM in Sydney on 8 November. For instance, where are the disclosures of Jones’ commercial connections to the gambling industry? And why doesn’t he ever talk about the enormous social costs through suicide, family breakdown, crime and financial hardship. Other sections of the media are an increasingly big part of the problem. Tabcorp recently made a $70m payment to News Corp as part of the closure of its Sun Bets joint venture in the UK, but stressed it retains a “good relationship” with the company. By that, it presumably means things such as campaigning to get the Opera House turned over for race promotions. Few people realise the Murdoch empire made profits of about $2bn launching, building and then selling Sky Betting and Gaming in the UK. In Australia it owns betting comparison sites Punters.com.au and odds.com.au and is the largest Australian recipient of gambling advertising through its pro-gambling newspapers and pay-television monopoly. Saturday’s Herald Sun featured a 16-page racing lift out largely funded by Tabcorp plus three full-page ads in the sports section from different gambling companies promoting the day’s race meets. News Corp also employs Jones at Sky and the Daily Telegraph joined the Opera House pressure. So how do we fix Australia’s globally unique gambling problem and instead take a public health approach to gambling addiction, which would treat the predatory industry similarly to our world’s best approach to tobacco control? The new Italian government is on the right track having recently introduced a blanket ban on all gambling advertising. They won’t be projecting gambling images on to the Colosseum any time soon. In Britain, the Football Association last year terminated its commercial deal with Ladbrokes so it could occupy the integrity high ground. That might be one for the gambling-dependent AFL and NRL to consider following. Perhaps one of the brightest hopes for those of us fighting for reduced gambling harm has been the recent move by AFL clubs such as Collingwood, Melbourne and the Western Bulldogs to sell their poker machine interests. If only the Labor party, the Construction, Forestry, Mining and Energy Union and the Catholic church would follow this lead and quit their pokies empires and associations in NSW and the Australian Capital Territory. We’ve certainly seen no such moves from the NRL clubs in NSW and Queensland. Indeed, former Victorian gaming minister Tony Robinson has described the NRL as “a franchise of the pokies industry”. And it’s a poorly run franchise too. On Friday, we were shocked to read about the appalling practices at the NRL-associated Steelers pokies club in Wollongong, which sparked a record $100,000 fine from the NSW regulator. Why wasn’t Jones talking about illegal $40,000 cash advances to Steelers gamblers on Friday, rather than hectoring Gladys Berejiklian and Opera House chief Louise Herron? Remarkably, the Steelers is a pokies club chaired by Peter Newell, the long-time chair of Clubs NSW and Clubs Australia. Newell expects Berijiklian will sit down with him this week and sign another four-year MOU with Clubs NSW at the same conference where Jones will be paid to speak. It’s about time politicians of all persuasions decided that the gambling industry is toxic and associating with it is to be avoided at all costs. Having by now gauged the outrage over her capitulation on the Opera House fiasco, Gladys should give the Clubs NSW conference and Jones a complete miss next week.